This is the last week for this month’s Photoshop contest!!! Enter below. Winners are announced Friday! I’m going to try to run one of these a month for now, bumping it Mondays at 12 or so. This month’s theme is Jar Jar Binks. 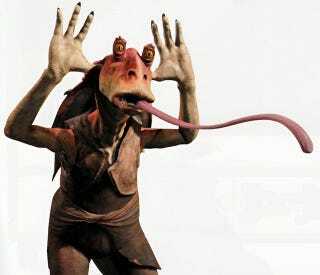 out Jar Jar and paste him into a new image with a background. PHC spent approximately 3 seconds to win last month. YOU CAN DO IT. Put Jar Jar where Jar Jar has never gone before. 1. Create your ‘Shop and save it to your desktop. Images must be at least 800 pixels wide. If they aren’t, you will be shot. 3. This brings up a comment window. Click the “image” icon in the toolbar. IF it’s not there hit the double down arrows at the top right. 4. This brings up Click “Choose file” if you’re uploading your ‘shop from your desktop navigate to it and click upload. The winning entry will receive 1 (one) copy of Serious Sam: HD Gold (That’s all the Serious sam games, folks!) for Steam. If you don’t want it you can gift it to a friend! Congratulations PyramidHeadCrab for his winning entry!